An excellent photograph of what is believed to be some of the SNCOs of the 24th Battalion, the Royal Welsh Fusiliers. The full details of the individuals in the photo are not known but the Regimental Sergeant Major seated centre is WO1 RSM James Crinyion. Crinyion was the son of a Fishmonger from Birkenhead and had a twin brother served in the Royal West Kent's (SSgt). Crinyion served as RSM of both the Denbighshire Hussars Yeomanry (DHY) and also when the Regiment was subsumed into the RWF as the 24th Battalion on 4th March 1917. Crinyion was later commissioned and went onto serve with the 15th Hussars post war. There is much information in the photo. Firstly the RSM is wearing his DHY cap badge which he was not officially authorised to do! When yeomanry regiments were re-designated into infantry battalions the officers were allowed to retain their yeomanry regiment’s collar badges only. The remainder of the regiment wore the badges of their new Regiment. This is clearly Crinyion’s stamp of character on his position. 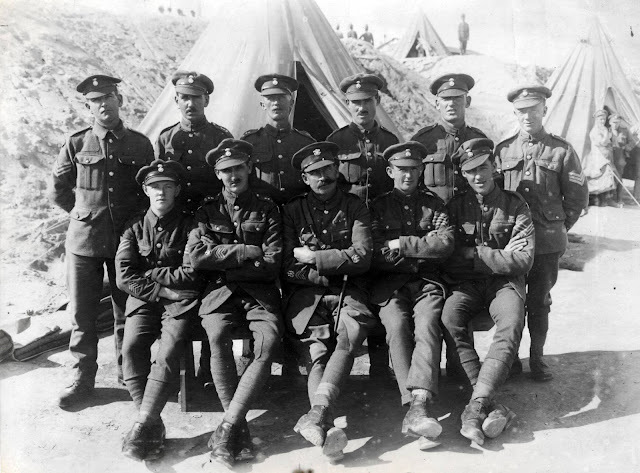 Those men with their right forearm visible are showing four overseas service chevrons which denote four years service outside of Great Britain. This puts the year that the photograph was taken as 1918. 24 RWF were moved along with the rest of the 74th (Yeomanry) Division from Palestine to the western front, France in early May 1918. The German spring offensives had left the British Army dangerously short of manpower on the western front leading to several divisions being transferred from General Allenby’s force in Palestine to France. Examining the background, the terrain looks arid and the troops on the high ground to the rear look like they could be Indian troops. This therefore may suggest that the photograph was taken in Palestine in the early part of 1918. All the SNCOs are wearing a battalion shoulder flash for recognition purposes. This appears to be a diamond with a white stripe down the middle. Whilst there are examples of a similar flash for the 5th/6th RWF in the Regimental museum archive we do not possess an example of the 24th Battalions shoulder flash. Also note that the RSM and the Company Sergeant Major to his right are wearing Jodhpurs. This is possibly another reference to their previous service at a yeomanry regiment.